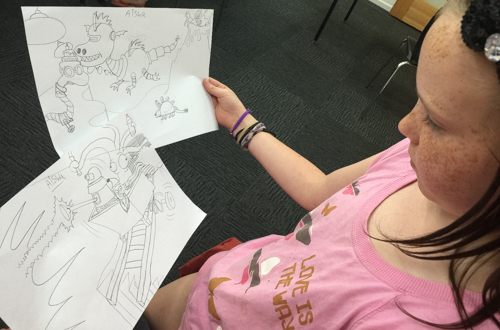 The girls have experienced an intensive series of drawing instruction with cartooning workshops over the last three days. 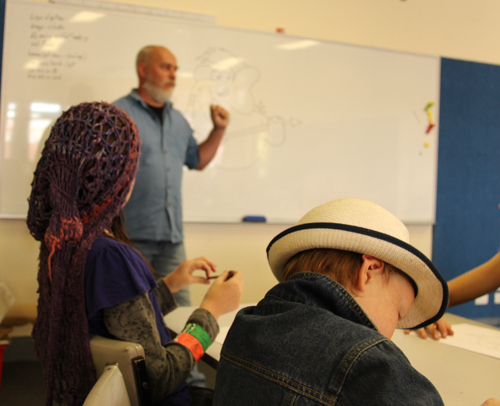 I enrolled Aisha and Brioni in a cartooning class before I realised that Bradfield Dumpleton was also offering workshops at the Cygnet Folk Festival last weekend. I appreciate the opportunity for the girls to sit in a classroom together and learn new material. 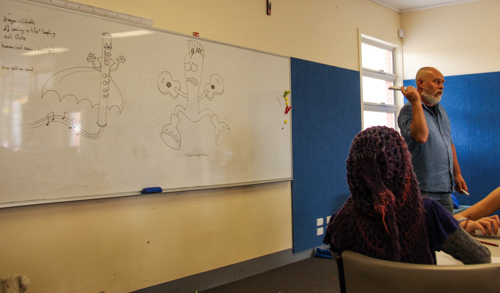 At the music festival, Bradfield took the kids' ideas and mixed them to create bizarre, musically-themed characters. 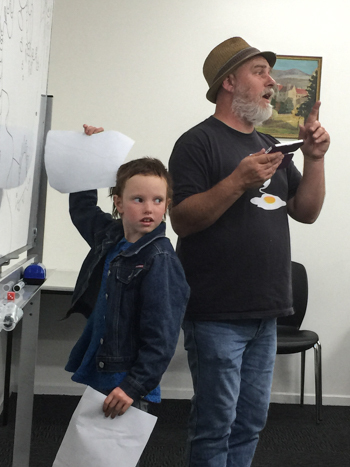 The workshops at Cygnet were only one hour long, but today’s class lasted two hours. I asked the girls what they thought about the classroom situation, and they weren’t fazed by having to sit at a desk for that length of time. The material and interaction remained interesting enough that they could embrace the subject matter easily enough. Bradfield has a way of relating to children through humour so that he comes across less as a tutor than as a buddy showing them new tricks. At the end of today's workshop, Aisha shows me the two pages of her completed drawings. 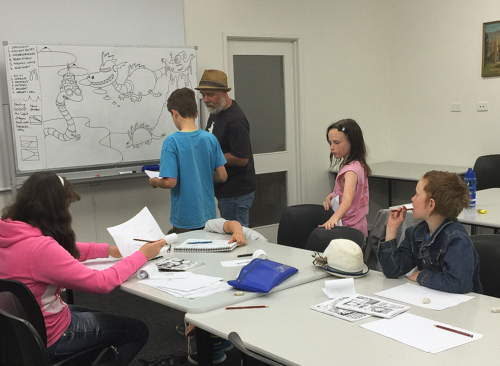 These cartooning workshops are advertised for children aged 9-12, but after I talked with Bradfield, he agreed to let 8yo Brioni participate. Aisha only wanted to go if her sister could come — not because she was afraid to do something by herself, but because she didn't want Brioni to feel like she was missing out! During the summer-holiday period, intensive lessons are often offered for kids, and these tend to suit our lifestyle better than traditional schooling. After three days of drawing lessons, the girls have improved immensely, although Brioni would prefer to find someone who can show her more life-sketching techniques. So I’ll keep an eye out for that and hopefully someone suitable will cross our paths soon!